I learned today that there is an exhibit about my father in the famous creation museum near Cincinnati. This museum is a multi-million dollar project set up by creationists as a pro-bible "natural history" museum that shows dinosaurs on Noah's Ark, and how the flood carved the Grand Canyon and much more. It's all completely bullocks and a number of satirical articles about it have been written, including the account by SF writer John Scalzi. However, around the corner is an amazing giant alcove. 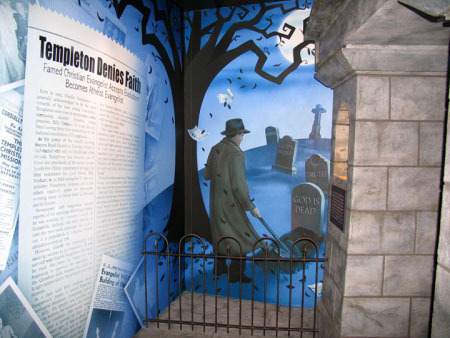 It shows a large mural of photos and news stories about my father as a preacher and later. 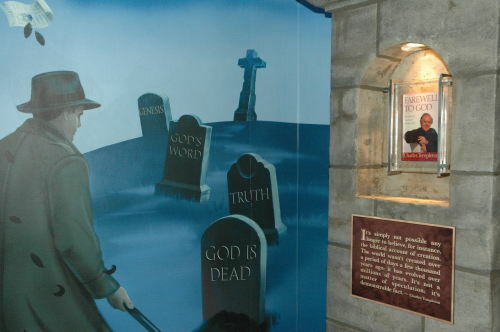 On the next wall is an image of a man (clearly meant to be him though the museum denied it) digging a grave with the tombstone "God is Dead." There are various other tombstones around for "Truth," "God's Word" and "Genesis." There is also another image of the mural showing it a bit more fully. Next to the painting is a small brick alcove which for the life of me looks like a shrine. I had heard about this museum for some time, and even contemplated visiting it the next time I was in the area, though part of me doesn't want to give them $20. However now I have to go. But I remain perplexed that he gets such a large exibit, along with the likes of Darwin, Scopes and Luther. Today, after all, only older people know of his religious career, though at his peak he was one of the most well known figures of the field. He and his best friend, Billy Graham, were taking the evangelism world by storm, and until he pulled out, many people would have bet that he, rather than Graham, would become the great star. You can read his memoir here online. But again, this is all long ago, and a career long left behind. But there may be an explanation, based on what he told me when he was alive. Among many fundamentalists, there is a doctrine of "Once Saved, Always Saved." What this means is that once Jesus has entered you and become your personal saviour, he would never, ever desert you. It is impossible for somebody who was saved to fall. This makes apostacy a dreadful sin for it creates a giant contradiction. For many, the only way to reconcile this is to decide that he never was truly saved after all. That it was all fake. Only somebody who never really believed could fall. Except that's not the case here. He had the classic "religious experience" conversion, as detailed in his memoir. He was fully taken up with it. And more to the point, unlike most, when much later he truly came to have doubts, he debated them openly with his friends, like Graham. And finally decided that he couldn't preach any more after decades of doing so, giving up fame and a successful career with no new prospects. He couldn't do it because he could not feel honest preaching to people when he had become less sure himself. Not the act of somebody who was faking it all along. However, this exhibit in the museum doesn't try to paint it that way. Rather, it seems to be a warning that too much education by godless scientists can hurt your faith. So there may be a second explanation. As a big-time preacher, with revival meetings filling sporting arenas, my father converted a lot of people to Christianity. He was one of the founders of Youth for Christ International, which is today still a major religious organization. I meet these converts from time to time. I can see how, if you came to your conversion through him, my father's renunciation of it must be very hurtful -- especially when combined with the once-saved-always-saved doctrine. So I have to wonder if somebody at the Creation Museum isn't one of his converts, and thus wanted to tell the story of a man that many of the visitors to the museum will have forgotten. Right now I'm in the process of scanning some of his books and will post when I have done this. And that first comment is exactly why critical, and well spoken people are more likely to throw christian ideas out the window. If we can't have a more comprehensible, logical argument for our beliefs than THAT, then we should all shut up. Good grief, that didn't even make any SENSE, much less follow basic grammar rules. "It says it, I believe it." What kind of herd-following, creed-based dribble is that? You just want to believe what it says? Well David also talks about the earth being flat too, you believe that? Maybe head back to the original greek and hebrew, where we can't be certain of some of the exact translations because the word is only used once in the whole bible! Which definition are you just going to believe? We don't just believe in private little interpretations of words here, we have to believe in interpretations of ideas, based on the context and the cohesive unity of thoughts in the bible. I'm even a christian, and this kind of illogical argument makes me recoil. PLEASE could we have christians comment that make some sense? how can you reject god? a have just listened to the story of G-D, Abraham and Issac at the Easter Vigil Mass, live from Saint Peter's Basilica in Rome. i have listened to the Pope's homily. i like the Pope. i like his homily, it is comforting. still, i cannot forget Abraham. i do not reject G-D. i just don't like him. in this story G-D is an insecure bully and a liar. his request to Abraham is lie. G-D does not want Abraham to actually abort Issac's life. in hindsight, i can see that Abraham is a terrible father--a coward. i picture myself in Abraham's situation. i too, would have been a coward and murdered my son. this knowledge intensifies my dislike of G-D. I have never asked or ordered a parent to kill is own child; so i have a strong opinion of who is guilty of the greater sin here. after all, would you or any parent - in Abraham's situation - have the courage to direct these words of Jesus [to Saint Peter} toward G-D, "Get behind me Satin! You are a hindrance to me; For you are not on the side of God, but of men." I am an evangelical, conservative Christian and I, too, am offended by the Creation Museum. Their wooden, literal biblical interpretation and twisting of scientific facts and theories to try and support a particular world view is a disservice to any one seeking the truth, not dogma. I disagree with Charles Templeton's philosophy and theology, but at least he seemed to be honest and sincere in his worldview. God Bless. 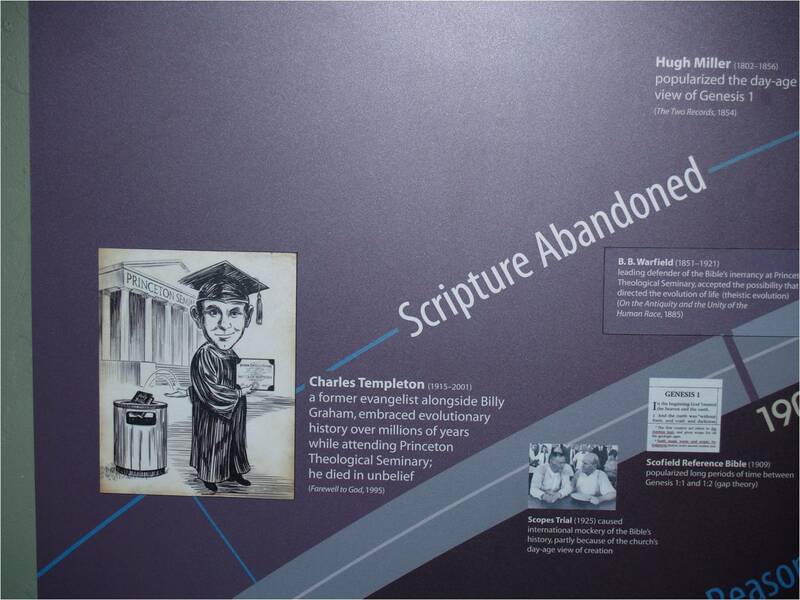 I visited that ludicrous museum and left with the mission of finding out who Charles Templeton was. Anyone who could make them that mad had to be great. I was inspired and heartened to learn that I wasn't alone in my journey. What was sickening was seeing parents force-feeding this junk pseudo-science to their kids. It is one room after another positing the "couldn't it have happened this way?" and giving glib answers to complex scientific ideas. I hated giving them twenty bucks. I could have got a two dollar discount by giving them my name and number but I was too embarassed that someone may some day see my name on their list. We should start a secret "thinker's code" when we go to the museum, like wearing orange. If you visit go to the Hollywood casino just down the road and have a beer for me. Charles Templeton is my new hero. I agree with Charles Rowland above who states, "What was sickening was seeing parents force-feeding this junk pseudo-science to their kids." I feel the same way every time I visit the Smithsonian's Natural History Museum. The scientific evidence for Darwinian evolution is just as scant as the Bible's account in Genesis. Something that cannot be replicated by the scientific method is philosophy or religion, not science. The Creation Museum is dogma, not true science, but so is the academic "party line" of the Smithsonian and just about every biology textbook printed today. I personally think that the Intelligent Design model goes alot farther in reconciling the evidence of nature in a logical, philosophical manner. It was a whole lot easier to understand than evolution. I couldn't figure out the Charles Templeton part, I searched for information and wound up here. Everyone should go-that "museum" is like no other. I recommend reading Jeffery Benner's 'Genesis, zen and quantum physics'...it cuts through the crap and gives you good reason to believe again.